The vaquita is going extinct at an alarming rate, from an estimated 600 individuals in 1996 to 60 in 2016, states a report presented to Mexico’s Minister of the Environment and Natural Resourcesearlier this month. It’s the world’s smallest marine mammal, with a maximum length of only 1.5 meters (4.9 feet). And with its dark eye patches and mouth that seems to curl up into a smile even after death, the vaquita is not missing out on the cute factor. Not much is known about the world’s most endangered marine mammal, which wasn’t described by scientists until 1958. It’s rarely seen even by the fishermen that sail local waters. Acoustic and visual surveying were used to identify the sound of the little creature and determine its population. The vaquita lives in just one area in the world – the upper Gulf of California, the area in Mexico between the western Baja California Peninsula and the mainland. This area includes traditional fishing grounds for Indigenous groups and other commercial fisheries. 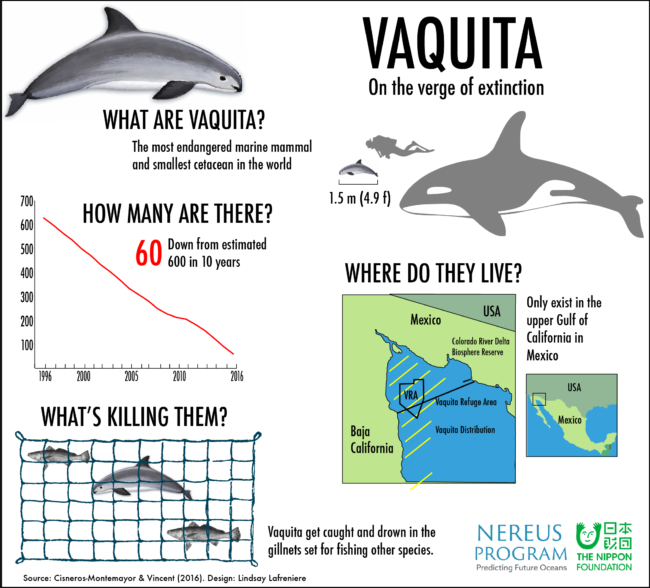 Most deaths of the vaquita are attributed to them being caught and drowned in gill nets that are set for fish and shellfish in the gulf. The vaquita’s story is closely tied to that of another endangered species – the totoaba. The totoaba fishery collapsed after reaching catch levels of more than 2,000 metric tons in 1942. In 1976, the totoaba became the first fish to be listed as endangered, and subsequently all fishing of it was banned. Unfortunately, illegal fishing continued as catching one is incredibly lucrative. Today, the swim bladders of totoaba can be sold in China for as much as $10,000 per kilogram. 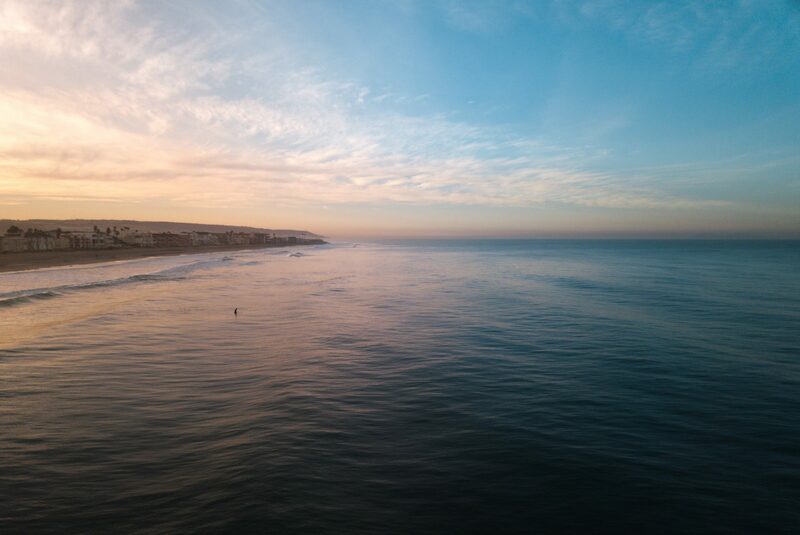 The area where both the totoaba and vaquita reside is part of the Colorado River Delta Biosphere Reserve, an area that has drastically changed over the past 80 years due to dam constructions and water diversions. 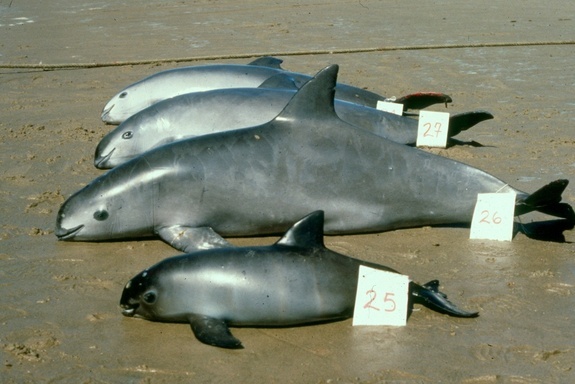 And why fishing has been killing the vaquita is also part of a wider social problem. Cisneros-Montemayor notes that there are few other industries or alternative ways to make a living in these small communities, with many people ending up going to the USA or turning to work in drug cartels. And while tourism has allowed a lot of money to flow into other areas of Mexico, that also requires a lot of infrastructure and previous knowledge.